I recently returned from a trip to Singapore and Hong Kong, two countries where feng shui is used everywhere at every scale. Singapore has used feng shui for many of its urban planning decisions for decades, using water, buildings, roads and civic structures to allow it to receive and hold the best energy it can, and to make the most of it’s energy over changing times. In the process it has transformed itself from a tiny, dry land into one of the most successful countries in the world despite its’ small size of 700 square kilometers. This is quite an accomplishment. Wikipedia lists it as the 36th – 39th wealthiest country in the world in terms of Gross Domestic Product (GDP), and Google searches at the time of this writing* bring it up to the 3rd to 5th wealthiest for GDP based on the quality of life of its’ inhabitants – in financial terms called Purchasing Power Parity (PPP) per capita. Hong Kong is a fascinating place with 7 million people in a country of only 1,042 square kilometers. Wikipedia lists it as the 37th – 39th wealthiest in terms of GDP, and Global Finance* lists it as the world’s 5th – 7th wealthiest country for GDP based on PPP. In addition to the natural feng shui advantages of the landform relationship of surrounding mountains and water, mainland and islands, evidence of feng shui design is everywhere. 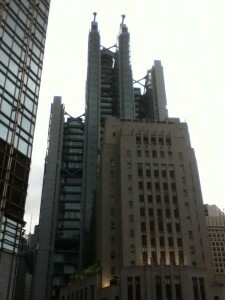 The Bank of China can look formidable in photos (even mine here shown lit up in the evening), and it’s angled black exterior and large antennas were criticized as creating negative feng shui initially, however it is clearly designed with feng shui specifications meant to benefit the bank. Its’ entrances, water features and placement on the site relative to the mountains, ocean, and roads around it, allow it as well to receive and hold the best energy available there. In feng shui terms, energy = money and water is related to money too. 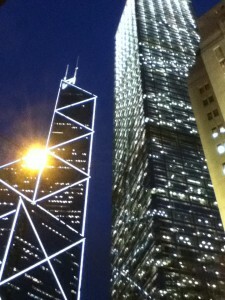 The Bank of China is on the left in the photo to the left. 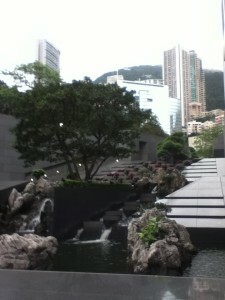 The photo to the right shows one of the water features at the foot of the Bank of China. 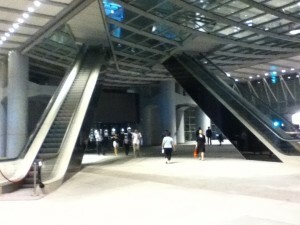 The HSBC designed by Norman Foster also used feng shui in the original scheme of its design, with it’s placement on the site, it’s unusual open plaza ground floor (photo below) and the escalator scooping energy up into the bank from the Northwest corner. Rumour has it that the bank was involved in creating Statue Square, the famous park across the street, to create a bigger Ming Tang, a feng shui term for a gathering spot for energy to collect, generally favourable at the front of a building. This park makes it likely that no other tall building will ever be built there, so the bank will continue to receive the energy of the ocean. HSBC is the building in back in the photo to the left. I didn’t get a good photo of it however they are easy to find online and worth a look as it has a very aggressive exterior which is not visible in this photo other than the symbolic cannons on the roof! For the record, not all feng shui practitioners use the same methods, and in my view the open ground floor plaza is much too open and loses energy instead of gathering it. This bank also uses an aggressive version of feng shui design, evidenced in the cannons and the forbidding exterior trusses (not visible in these photos) which is not my preference. 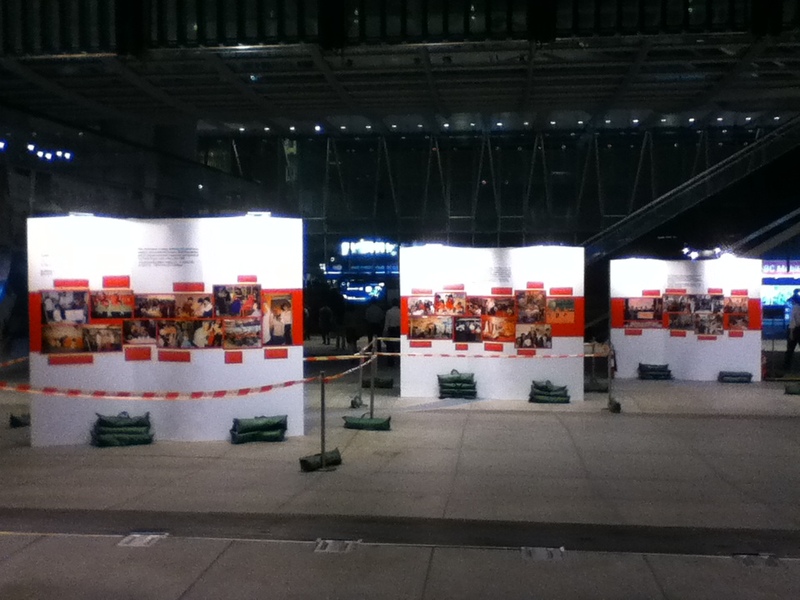 nk is also using feng shui to help balance the open plaza with the placement of pop up displays on one side of the plaza, positioned to help hold the energy there, and keep it from rushing through so quickly! The skyline of Hong Kong is considered by many to be the best in the world and it is much larger with many more skyscrapers than much larger cities. 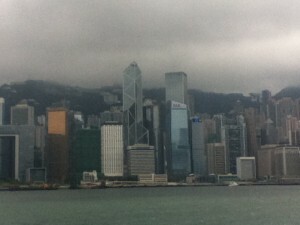 The urban planning of Hong Kong is remarkable as well. Both Singapore and Hong Kong are quite small yet both are very vibrant, and very energetic and successful economically, and both use feng shui in their large scale decision making – hardly a coincidence. *From Global Finance (gfmag.com) 2012 Ranking (from richest to poorest) for Gross Domestic Product based on purchasing-power-parity (PPP) per capita. Figures and estimates are from the International Monetary Fund World Economic Outlook Database, April 2012.